FotoInsight anuncia hoy el lanzamiento de una nueva línea de foto regalos de cristalería. La nueva gama de cristalería con foto grabada por rayo láser incluye marcos de cristal, llaveros, porta plumas, llaveros y un corazón de cristal. Para más inspiración en los regalos del día de San Valentín ofrecen empresas de revelado en línea, como la FotoInsight una multitud de ideas con fotos digitales impresas. FotoInsight, una empresa líder en servicios de revelado de fotografía digital en línea ha anunciado hoy una nueva gama de artículos de cristalería con imágenes de fuentes digitales grabadas por un proceso láser. La gama incluye marcos de cristal con la foto grabada, llaveros, porta plumas, un corazón de cristal y un tazón de vidrio con foto a color. Estos artículos nuevos de cristal y vidrio se lanzan en adición a gama de regalos de FotoInsight ya existente, como por ejemplo libros de fotos impresas, pósters, camisetas, tarjetas y calendarios. FotoInsight espera que la nueva cristalería con foto será muy popular como regalo en el día de San Valentín y el Día de las Madres. “El amor es un sentido especial y debe ser expresado de manera extraordinaria. El San Valentín es el día perfecto para expresar los sentimientos. Así que el regalo para el día de San Valentín es sumamente importante para expresar sus sentimientos de corazón y para hacer este día especial” dice Catalina Martínez, Gerente de Comunicación de FotoInsight. Al buscar regalos para el día de San Valentín para la pareja se desea lograr el toque personal, que dulces y flores no pueden proveer. Servicios de impresión de fotografía digital en línea como la FotoInsight pueden ayudar a transformar una foto propia en un regalo de San Valentín que será atesorado por años. • Un clásico regalo del día de San Valentín es el juego de dos taza con foto. • Donde pega la flecha de Cupido hay historias que contar con un album de fotos impreso. Con una variedad de temas creativos y diseños de páginas, estos libros únicos ayudan a recordar un escape romántico o momentos cotidianos compartidos. FotoInsight vende libros de fotos con cubierta a color y completamente editable desde 18,95€ para 26 páginas impresas a color (más entrega). • FotoInsight le da un nuevo sentido al “quedarse en casa” en el día de los enamorados: abrazar al ser querido y un osito de peluche acogedor. Agregar efectos especiales o texto a la fotografía digital impresa en la camiseta del osito lo hace un regalo muy especial para el dia de San Valentino. • En lugar de sentimientos comprados en tiendas y expresados por "cartoon characters", tarjetas de San Valentín o de las tarjetas de cumpleaños de FotoInsight permiten decir “te amo” en un estilo propio. Tarjetas con fotos pueden personalizarse con un poema romántico o expresiones sencillas directamente del corazón. • ¿La imagen de un ser querido ampliada? Pósteres de FotoInsight sobre papel fotográfico se venden desde 1,49 € (más entrega) para una impresión 20 x 30 cm (aprox. A4) y pueden ser hasta 50 x 75 cm – verdaderamente grandes. • Mostrar amor los 365 días del año. Crear recuerdos diarios es fácil con un calendario con fotos propias. Calendarios fotográficos de FotoInsight pueden iniciar cualquier mes del año. Por ejemplo un calendario planificador ofrece suficiente espacio para anotar fechas para cenas románticas; calendarios de fotos son fáciles de ordenar y cuestan desde 14,95 €. Free software from FotoInsight helps to create coffee table style photo books with covers which can be fully edited. Without any prior experience, beginners can present and preserve their own digital photographs in individual, carefully crafted, glossy photo books. Dublin and Cambridge. 12 January 2007. – The personal, coffee table style photo book is rapidly developing into a very popular photo print product and is about to overtake the traditional 10x15 cm / 6”x4” prints as the most common photographic printed output. Rarely has the development of a consumer product progressed as quickly. FotoInsight, a leading Internet photo service launched photo books from an online facility with limited editing features one year ago. Today the company FotoInsight is introducing a revolution in photo book software – a time saving fade-proof record of precious memories for print. It allows novice and inexperienced users to layout their digital images in full colour double page spread, move, crop and edit pictures to any size and add text freely within the photo book, on the cover and on the book spine. FotoInsight’s Managing Director Klaas Brumann comments: “Our customer’s expectations have been growing rapidly. We have decided to provide photo books only through our software, which we is compact download. Our free software provides a photos book draft within three minutes. To the astonishment of most, it looks just like a professionally laid out coffee table style photo book.” As photo books can be made with up to 98 pages, which can take in excess of 500 images the software also helps to improve the online upload to the photo book production facilities used by FotoInsight. Andy White, Internet Sales Manager at FotoInsight's production partner Standard Photographic Ltd states: "We are extremely proud to launch this exciting new project with FotoInsight in Ireland and other countries. The photo book is far and above anything else on the market. This is a major step forward for both companies." With the launch of the photo book software FotoInsight broadens its photobook range. It now starts with photo booklets (from €7.95) and offers linen cover as well as full colour soft and hardcover options in roughly A4 size or squared, all in all 64 different sizes and shapes. All photo books (square and A4) are available with an editable full picture soft or hard cover or with a linen cover and a very durable channel bind. Channel bind covers use a revolutionary spine forming one of the strongest binds available. The software for the photo book starts with an easy to use assistant. According to FotoInsight the assistant provides a photo book draft layout within 3 minutes, already with a professional look. This helps to create a printed photo album with hundreds of images quickly. Such layouts can still be fully edited; adding pictures one by one or complete folders, a time saving option. The application provides graphic images for backgrounds; nicer though it seems to use own pictures as a background of a page or a full double page spread. Instead of using the assistant to create a layout, pages can also be designed individually. This allows rotating and skewing images freely. Any picture can be spread across the page or double page from edge to edge, set on its own or as a background. For example land scape and panorama pictures look great across two A4 pages. FotoInsight also sets a narrow white line around pictures in the book to set them apart from photographic backgrounds, just as usual in professionally edited coffee table style photobooks. The software provides a useful image editor, to edit individual images. It includes tools to move freely, rotate and label images and to adjust brightness, contrast or saturation. The editor in the software also covers red eye removal and automatic contrast adjustment; plus an undo function. It comes handy that the edited images can be saved as a jpeg. When saving the photo book project the CeWe Photo Book software presented by Fotoinsight offers a different approach. Instead of embedding the image files into a lay-out file (as would happen with a pdf-file for example) the software creates a sub-folder where all images are copied into as jpegs. This has the advantage that each individual photo can be post edited with any digital imaging software. It also allows to batch process these images with other applications. In the age of the digital camera and camera phones people snap away happily taking lots of pictures to remember their special events. However generally these digital images languish on computer hard drives and the personal memory fades as to who, why, where and what the pictures were about. This is why recently photo albums have seen a revival. FotoInsight have combined the digital age with the growing interest in printed photo albums and taken this to the next step with the Photo Book – bringing all kinds of new layout tools and making it easier and cheaper to create a memorybook with friends and family. According to FotoInsight it doesn’t only print photographs in high quality, but also text is clear, sharp and easy to read. Great for those who like to add ample text to their images. FotoInsight offers an independent online photo service, fully flexible to be used with images from any digital camera. According to FotoInsight’s management the online service offers superior quality at lower costs when compared to inkjet printing. "Quality is our priority. All materials we use are subject to extensive testing and are guaranteed by their manufacturers to last 100 years. This guarantee extends to photo printing on real photographic paper as well as to the CeWe Photo Books", emphasises Dr. Rolf Hollander, CEO of FotoInsight's production partner and Europe's largest photo finisher. FotoInsight offers an extensive array of award-winning photo print and photographic gift items for the consumer, business, photography, and graphic arts markets. From Cambridge, Mr Brumann comments: “Photographic memories must never fade. Our technology is smarter, providing long lasting Memory Books in superior quality.” The professional production process keeps costs low, so that FotoInsight can offer printed photo albums starting with the 14x13cm photo booklets for only €7.95 - plus €4.99 for postage in Ireland, the UK and most other European countries. Top of the range of 64 models are the 22x30cm photo books with up to 98 pages. FotoInsight offers a volume discount when ordering 20 or more photo books of the same format and size. FotoInsight startet heute eine neue Reihe von Foto-Kristallwaren und Fotogeschenkideen zum Valentinstag. Die neuen Fotokristall-Geschenke bieten Kristallfoto-Rahmen, Fotokristall Schlüsselanhänger, einen Fotobecher aus Glas, einen Stifthalter und ein Kristall Fotoherz. FotoInsight graviert über das Internet hochgeladene Fotos in Kristallwaren und erstellt damit wohlinspirierte Geschenkideen. FotoInsight, ein führender internationaler online Fotoservice bietet ab heute und pünktlich für Valentinstagsideen neue Glas- und Kristallgeschenke mit laser gravierten digital Fotos. Die neue Reihe individueller Fotogeschenke aus Kristall und Glas umfasst einen Kristallblock Bilderrahmen, Glasblock Stifthalter, Schlüsselanhänger, Kristallherz mit Lasergravur und ein Glasbecher mit Farbfoto – neue Geschenkideen um den Valentinstag dieses Jahr noch persönlicher zu gestalten. Insbesondere das Kristall Fotoherz erscheint eine ideale Foto-Geschenkidee „für’s Herzblatt“. Die neuen Fotokristallgeschenke bereichern FotoInsights schon bisher umfangreiche Reihe von Fotogeschenken, gedruckten Fotoalben, Postern, Grusskarten und Fotokalendern. • Wer von Kupidos Pfeil getroffen hat Bilder und Erinnerungen die es in einem Fotoalbum zu erzählen und festzuhalten gilt, wie dem FotoInsight Hardcover Fotobuch. Mit einer Reihe kreativer Themen, Umschlägen und komplett flexibler Seitengestaltung helfen diese einmaligen Fotobücher einen romantischen Ausflug oder einzigartige Momente in farbenfroher Erinnerung zu halten. Fotobücher im farbigen und voll gestaltbarem Einband gibt es schon ab 18,95 € für 26 Seiten (zzgl. 3,99 € Postversand). • FotoInsight gibt dem zuhause bleiben am Valentinstag eine neue Perspektive: Schmusen mit dem Partner / der Patnerin und einem kunddeligen Foto Teddy. Der Teddy trägt ein mit dem digitalen Foto bedrucktes Hemd, das mit Effekten und Text versehen werden kann um es noch persönlicher zu gestalten. • An Stelle gekaufter Gefühlsausdrücke von Cartoonfiguren sind selbstgestaltete Valentinstagskarten eine sehr persönliche Liebeserklärung. Fotogrußkarten können mit einem romantischen Gedicht oder einfachen Worten die aus dem Herzen sprechen sehr persönlich gestaltet werden. Gratis eCards können von eigenen oder vorgegebenen Fotos versand werden. • Ein Bild des geliebten Partners oder der Partnerin im Grossformat? FotoInsights Poster gibt es schon ab 1,50 EUR (zzgl. Versand) für einen etwa A4 grossen Abzug. Die Poster auf Fotopapier gibt es in verschiedenen Größen, bis zu richtig grossen 50 x 75 cm. • Liebe zum Ausdruck bringen, 365 Tage im Jahr. Tägliche Erinnerungen an die oder den Liebsten können mit einem Fotokalender an die Wand gehängt oder auf den Tisch gestellt werden. FotoInsight Fotokalender können in einem Monat nach freier Wahl beginnen. Ein Wandkalender bietet ausreichend Platz um Termine für romantische Abendessen zu notieren. Kalender von digitalen Fotos sind einfach zu gestalten und bestellen. Es gibt sie bei FotoInsight ab 13,99 €. • FotoInsight bietet auch eine reiche Auswahl an Fotogeschenken zum Valentinstag. 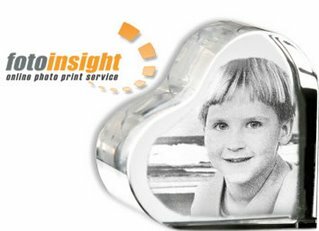 kommt das Fotokristall Herz, ein Fotokristall Memoclip, ein Stifthalter ein Kristallblock mit lasergraviertem Bild (anstelle eines Bilderrahmens) sowie ein Becher aus gefrostetem Glas mit Farbfoto. FotoInsight bietet einen online Fotodienst, der mit Bildern von jeder digitalen Kamera genutzt werden kann. Laut FotoInsights Geschäftsleitung ist die Fotoentwicklung des online Dienstes im Vergleich zu Tintenstrahldruckern günstiger, bei gleichzeitig höherer Qualität. FotoInsight bietet ein umfangreiches Sortiment an Fotodruck-Produkten und Fotogeschenken für Heim- und Geschäftskunden, Profifotografen und den grafischen Markt.